Brought to us by the Multi-Talented Ms. Gina Sharp! 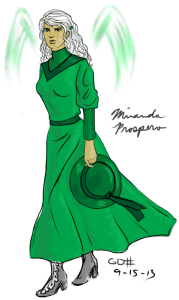 Here, a special treat today, a fan-drawn picture of Miranda!!! But Ms. Sharp does not merely draw! No! She also writes music. Here is a link to a song she wrote for Menelaus Montrose, the Future Texan hero of John's Count To A Trillion series.